After a fancy breakfast at the B&B (omelets, fruit and coffee served from a silver service), we get the heck out of Appomattox. A sleepy town? No, more like a dying one. 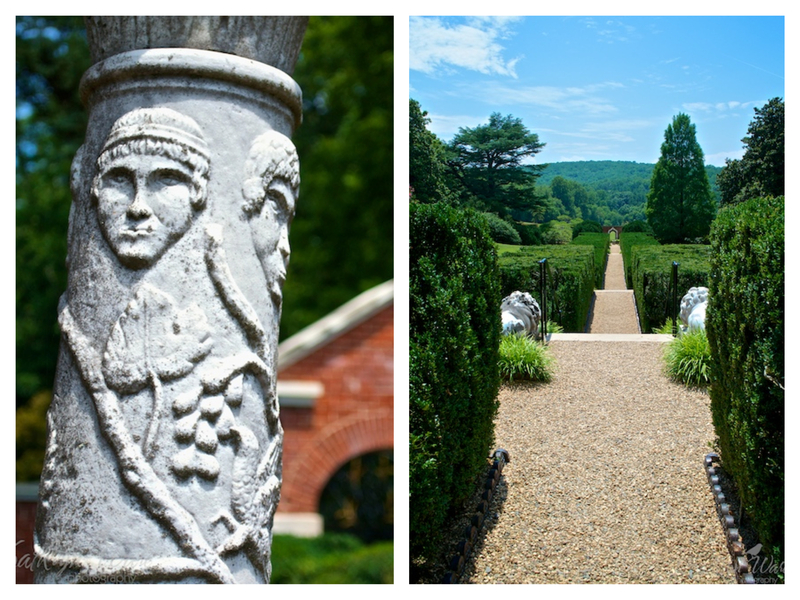 We make a detour to stop at Poplar Forest, Jefferson’s retreat and wow, am I glad we did. The location is beautiful, up on a hill, surrounded by trees. We take a fascinating guided tour, learning the history of the house (designed by Jefferson and thought to be the epitome of his design talents) and getting a glimpse of the in-progress restoration. The octagonal house is filled with natural light, comfortably-sized rooms are centered around a tall central dining room with a skylight above. There’s a sunken garden in the back and the house is centered between two small man-made hills, covered with willow and poplar trees, which provide symmetry, connected to the structure by two rows of paper myrtle trees on either side. We spend a couple of hours at Poplar Forest before getting back in the car for the eight hour drive back to Georgetown, KY. We squeeze in an hour’s drive on the beautiful, twisting, turning Blue Ridge Highway. I can imagine how gorgeous it must be in the fall. The drive back is quick and fun, up until the very last hour when we run directly into a wicked thunderstorm with pounding rain and frightening bolts of lightening scratching horizontally across the sky. Near-zero visibility at times makes for white-knuckle driving. We finally arrive as the third wave of the storm passes over and we drag our stuff into the house in between cloud bursts. I collapse on the couch with a well-earned beer. Over a dinner of take-out and laughter, we recall our Virginia adventures. Start our day with a return trip to Hyperion Espresso. Along with fresh pressed coffee drinks, pastries are their specialty. Yesterday I had the cinnamon swirl croissant and today the chocolate croissant. Both excellent. We fill our water bottles with ice in preparation for the 100-degree day and check out of our hotel. Next stop: Appomattox. A nice two-hour drive through rolling hills, past lots of logging trucks hauling felled trees. We decide to visit the new Museum of the Confederacy first and spend about 90 minutes viewing the permanent exhibit on the end of the war and an interesting temporary exhibit of flags of the Confederacy. We’re all glad not to be touring battlefields in this brutal heat. With an hour before closing time, we race over to Appomattox Courthouse and with 45 minutes to spare, we’re admitted to the park (free of charge!) with just enough time to tour the McLean House and see the room where Generals Grant and Lee met to sign the surrender. Even if the house is re-constructed (from the original), it’s amazing to see. I admit I had goosebumps standing in a room with the weight of so much history inside it. Our final night on the road is spent at the nicest lodging in town, a B&B called the Babcock House. Unfortunately, they’re not serving dinner the week of our stay, and Appomattox has very little to recommend itself as a dining destination. (Everyone we asked for recommendations said to come here.) Lunch at Granny Bee’s is mediocre and slow, even by Southern standards, and dinner is a disappointing stop at the Dairy Queen, followed by a trip to Kroger’s for cold beer. We spend the evening in our comfortable suite of rooms, reading, writing, and chatting. We begin our day with coffee and pastries at Hyperion Espresso, a popular corner cafe with plenty of outdoor seating, followed by a walk through the historic downtown. We make the short drive to the Fredericksburg battlefield and do the loop walking tour along the sunken road and stone wall, a scene of unbelievable carnage during the war. While most of the wall is a reconstruction, a portion of it dates to the original period. Standing at that point, imagining the Confederate soldiers hunkered down behind it while waves of Union soldiers were cut down trying to cross the field in front is one of the more sobering and moving moments of our Civil War tour. Afterward, we hike up to the Federal cemetery on the hill above and then drive around the remainder of the park, stopping along the way at points highlighted in the guide book. A portion of the original wall. Next stop, Spotsylvania, where we hike to the site of the battle of The Bloody Angle, a wide open meadow between tree lines, yellow with late season wildflowers, and dotted with monuments to fallen regiments. Of particular note is the deteriorated remains of Confederate earthworks, another scene of bloody fighting lying now as a scene of calm and beauty. Karen and I walk through the forest, tracing the route Colonel Emory Upton followed with his men on the charge, up the 200 feet of open field they had to cross toward the Muleshoe. Here is a true time-traveling moment, since the terrain is virtually unchanged since that day in 1864. Eerie and awe-inspiring. Back in the car, our final stop of the day is Chancellorsville, which doesn’t offer as much to do, though we do make a point to see the spot where Stonewall Jackson was mortally wounded. Just as well. By this point, we’ve had our fill of battlefields, war and Civil War history. Hot and tired, we turn back to the hotel, driving along scenic byways all the way home. One last evening walk through downtown Fredericksburg to a recommended dinner destination, La Petite Auberge. Unfortunately, we don’t get the ambiance of the indoor garden since we’re seated in the restaurant’s unimpressive lounge, but the food is good. I have soft shell crab amandine, which is delicious. The creme brûlée, less so. We start the day with a family breakfast and spontaneous mini-college reunion. We meet Tony, Laurie and her five-year-old daughter Beatrix for breakfast–so great to see Laurie and finally meet her (not-so) little one, adorable with personality to spare. During our meal, Karen’s college roommate pops by for an impromptu and very brief meet-up. Rebbie is days away from moving to Hawaii and just happens to be in Manassas at the same time we were. Thanks to Facebook postings, we’re able to get together for a quick catch-up over coffee. We say our goodbyes to Laurie and Beatrix and follow Tony over to the Manassas Battlefield National Park visitors’ center to begin our personal guided tour. As we stand over-looking the Bull Run battlefield, he gives us a run-down of the First Battle of Manassas. Throughout the hour we’re there, other visitors wander over and eavesdrop on Tony’s lecture. Next, it’s time to see the sights of Second Manassas. We all climb into the car and drive from one battlefield to another as Tony tells the tales of what transpired in 1862. Tony really knows his stuff and communicates the history like a master storyteller, bringing the past to life. As a veteran himself, Tony’s first-person perspective of battle are given a certain amount of gravity. Four hours and as many stops later, we can’t believe how time had flown by. This has been a phenomenal way to immerse ourselves in history and we can’t wait to do it again, hopefully sometime soon. After saying goodbye to Tony, we head back to the gift shop to buy postcards and walk the first battlefield, shooting photos in the light of late day. Next stop, Fredericksburg, our base for the next few days on the Civil War battlefield tour. Our hotel is located in the historic section of Fredericksburg and we enjoy walking the streets (the same trod by George Washington and Thomas Jefferson) and window shopping on our way to dinner. We score big at yet another local/sustainable/organic eatery, Foode, a small, vibrant restaurant with fantastic food and an impressive beer and wine selection. Jan and I have the BBQ chicken, served over tasty mashed potatoes, and crisp green kale with cherry tomatoes and lemon. So good. On our way back to the hotel, we walk over a bridge to get a peek at the nearby Rappahannock River, which is looking very low. After treating ourselves to ice cream at a local shop, we spend a quiet evening writing and reading. James Madison’s home is gorgeously restored to the period when he and his wife Dolly lived there following Monroe’s retirement in 1817. The home, added onto twice during his time there, is lovely, comfortable with lots of natural light, porches and beautiful vistas. Our tour guide is terrific, another font of American history and local information, who took plenty of time to answer the many questions posed by our group, all of which led to additional interesting tidbits. A slave cabin under restoration. After the group tour, we spend a bit of time wandering the grounds and the formal garden (the rest of the DuPont family additions were thankfully removed during the restoration of the house.) The cafe in the visitors’ center was unimpressive so we decided to drive into the nearby town of Orange for lunch. A wise choice, as we discovered a local BBQ joint serving delicious pulled-pork sandwiches with the requisite Southern side of fried dill pickle spears. Because of the late start and the length of time spent at Montpelier, we’re not able to take the Sky Line Drive through the Shenandoah Mountains. We have someone waiting for us in Manassas, so take a more direct route and save the Sky Line for another trip. After a few hours on the road, we finally arrive in Manassas with the rush hour traffic and check into our hotel. We meet Tony, a member of the family and our resident Civil War expert, for dinner where talk revolves around Jefferson, Monticello and fascinating background information for tomorrow’s Civil War battlefields tour. A fantastic day, filled with American presidential history. After breakfast in the hotel, we hop in the car for the 15-minute drive to Monticello, climbing the hill to the visitors’ center where we wait for a shuttle bus to take us the final leg up to the house and grounds. To finally see Thomas Jefferson’s masterpiece, a repository of so much history, is thrilling. We begin with the house tour, led by a very personable UVA student; the highlight for me is seeing Jefferson’s bedroom and library. After the standard tour, which includes the main rooms on the first floor and the immediate grounds, we kill a bit of time looking around in the basement (work areas, store rooms, wine cellar, slave quarters) before the start of the “back stage tour,” which takes us through the second floor of Monticello. We see a few bedrooms (none of which were furnished with Jefferson items but you get the idea) and it’s nice to see the view from above. We also get to climb the incredibly narrow winding staircases to the second floor, spending time in the dome room and the hidden alcove over the porch. Double doors open onto the hidden alcove over the porch. From the upstairs hallway, looking into the main entry way. A big kitchen needs multiple burners. Afterward, we take the Slavery at Monticello and garden tours, both of which are chock-full of information. I’m impressed that at no point do they shy away from the subject of slavery, Thomas Jefferson’s complicated relationship with the institution and, of course, Sally Hemmings. All the tour guides are excellent and really know their stuff. On the day we were there, Monticello was busy, but not insanely crowded, and I marveled at the impressive volunteer army on hand. Five hours later, we’ve seen it all, and wrap-up or visit with lunch at the visitors’ center. I quickly snapped this photo when a group of young girls ran up to the base of the steps (you can just make them out above the tree stump) and began worshiping the house with full flailing arm movements. Next, we’re off for a quick visit to James Monroe’s abode, conveniently located about a five minutes drive away. Quite a stark contrast between these homes. Ash Lawn-Highland is smaller, humbler, less impressive but no less interesting. Monroe’s home is notably different from when he lived there (the second floor was added later) and the later time period is quite apparent by the different style in architectural style, furnishing and decor. We take a quick house tour, given by a young man dressed in a sports coat on a very warm day. I take a photo of a 300-plus-year-old tree on the grounds and we call it a day. Montpelier, James Madison’s home, would have to wait until tomorrow. Back in Charlottesville, we take a dusk walk around the UVA campus. Much of the historic Jefferson-era section is under restoration, looking less than its best. It’s still fun to see after hearing and reading so much about the place. Dinner is at The Virginian, a local university hangout. So far, Virginia’s craft beer scene is nothing to write home about. On our way out of Charleston, we grab an early breakfast at Frutcake–a great cup of coffee and a very tasty blueberry scone and egg & sausage muffin. Undeterred by the drizzly weather we hit our first landmark stop of the trip: The New River Gorge Bridge. We make the descent down to the bridge overlook, snap some photos, and marvel at the view. Even with the fog and under overcast skies, the bridge is wildly impressive. So what if it’s no longer the world’s longest steel single-span bridge (it’s third), NRG Bridge is quite a marvel. Continuing on to the Virginia state line, we stop in the cute town of Lewisburg, WV for lunch. The Stardust Cafe was a real accidental find, tasty locally-sourced ingredients and loads of character. My avocado melt was fantastic. Before we hit the road again, we three split a pot of French press coffee and a slice of the delicious cocoanut cake that has been tempting us from the display case of delectable baked goods. Back on the highway, we’ve left coal country for the lush, green-forested winding roads through the Appalachian mountains between West Virginia and Virginia. We reach our destination, Charlottesville, and check into a very nice Courtyard Marriott near the University of Virginia campus. At dinnertime, we walk about a mile over to a pedestrian mall that is hopping with activity, shoppers and diners, tourists and locals. We dine on fresh fish at Blue Lite, sitting outside in the middle of the mall, sipping local beer and people watching. In preparing for my next road trip east (just a few weeks away), I was surprised to see that I’d never updated my blog with the particulars of last year’s trip east to Virginia. So, in an effort to catch up and thoroughly confuse things, I’m posting my trip notes from last summer now. The drive from Chicago to Georgetown, KY is uneventful. We pass miles of brown fields baking in the sun. Rows of corn that look small and tired. We make good time to Jan’s, about eight hours, including a stop at New Albanian Brewery for lunch and to pick up a growler of beer for our evening meal. At Jan’s, we crash for a few hours, resting and reading until dinnertime. A tradition was born on a previous trip: BLTs made with bacon cooked on the grill by Jan’s neighbor Day–the secret is hickory chips on the fire–and home grown tomatoes from the rooftop garden. We polish off the growler and watch the sunset from the roof. Early to bed. We hit the road to West Virginia, stopping for lunch in Ashland, KY. The town isn’t much to write home about. We all get a chuckle out of lunch at Crisp’s Dairy Treat, a local hot dog/hamburger/ice cream take-out joint. I order the hot dog “with sauce,” which turns out to be ground hamburger. Hmmmm, meat on meat. I sincerely hope all our meals will be looking up from here. Before leaving Ashland, Jan wants to make a stop at “The Judd Museum.” Don’t look for it in any guide book; it’s actual name is The Highlands Museum. It’s as small town as a museum can get and prominently features displays of the region’s famous musical talent–Ricky Skaggs, Crystal Gale, the Cyruses (Miley and Billy Ray), and of course The Judds–complete with costumed and bewigged mannequins. Let’s just say it didn’t inspire me to augment my music library. Had a pleasant drive once into West Virginia. Charleston, the capital, looked fairly grey and grim, a town that’s seen better times. The overcast weather didn’t help. We check into the Best Western and then walk through the historic district toward the golden-domed capital building. For dinner, we take a chance on Bluegrass Kitchen, a restaurant that touts locally grown/sustainable cuisine, with a cozy bar populated by locals. To our delight, ours is a memorable, relaxed meal accompanied by some interesting local brews. I had the locally caught trout with grits and braised kale. Outstanding. If I ever find myself in Charleston again, I will definitely make a return visit. While walking the mile back to our hotel, we pass a cute little bakery and make a note to stop there for breakfast on our way out of town. I think the best way to wrap up my recent road trip through Virginia would be to say we were already planning a return trip before we’d even arrived home. Ten days of scenic byways and an immersion in American history. Comfortable accommodations, tasty local cuisine and friendly people with the slowed down pace of Southern hospitality. After an over-night in Georgetown Kentucky (where we picked up our third traveler) and Charleston, West Virginia (making a point to stop at the New River Gorge) we spent a week in Virginia. Quite by chance, the trip was divided nicely, the first half with visits to the Founding Fathers’ homes and the second with tours of Civil War battlefields. James Monroe, the forefather minus his forefinger. The main goal of the trip was to see Monticello, which we did in spades, spending nearly the entire day on the mountain touring inside and outside Jefferson’s home. We also visited Ash Lawn-Highland, James Monroe’s home and the gorgeously restored Montpelier, home of James and Dolly Madison. The McLean House at Appomattox Courthouse. The second half of the week was spent visiting Civil War battlefields: Manassas, Fredericksburg, Spotsylvania Courthouse, Chancellorsville and ending, appropriately, at Appomattox Courthouse. Jefferson’s octagonal masterpiece, Poplar Forest. Our final stop in Virginia was Thomas Jefferson’s retreat, Poplar Forest, which was fantastic and doubly interesting because they’re in the middle of a complete down-to-the-bare-bones restoration. Spent a day in the Lexington area visiting friends and sampling local craft beer before making the final leg home through Indiana. All-in-all, it was a fantastic trip. I’m finally getting around to processing photos and will post more detailed entries in the weeks to come.